Why Get a Heated Dog Bed? Having a heated dog bed on-hand for your furry friend is an excellent idea if you live in a cold area, if the dog is older, or if you just want to make sure that they're comfortable at all times. Buying the best heated dog bed available can help to ensure that your dog is happy when they use it and that it's a safe choice that won't overheat and cause burns or other problems. However, because there are dozens of heated dog beds available, it can be very difficult to narrow your choices down and find a high-quality one that won't break your budget. This is why we've rounded up the top five safest heated dog bed options along with a comprehensive buyer's guide. A heated dog bed could be a great idea no matter where you live, and there are several solid reasons why you may want to consider getting one for your dog. We've highlighted the most important reasons below because we want you to get a good idea of what the benefits are. Arthritis - As your dog ages or if it's a larger breed, there is an increased chance that they could develop arthritis in their joints and have trouble moving around. The heat from their dog bed can seep into their joints and give them some pain or inflammation relief. 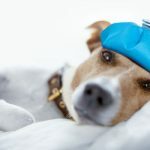 Outdoor Temperature Fluctuations - Some dogs may like to be outdoors, and you can't control how warm or cool the weather is, especially if you're not home. A heated dog bed gives your dog somewhere warm to go if the temperature drops, and this allows them to enjoy the outdoors longer. Space and Security - Dogs like to have their own space and feel secure just like humans do. A warm bed gives them a space where they can go and rest, and it can also help them to feel more secure when they're in it. 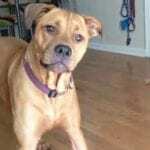 Transitioning Puppies - If you get a new puppy and they weren't weaned until later, they could have trouble transitioning once you bring them home. When this happens, a heated bed is a quick and easy way to encourage a smooth transition because the heat from the bed mimics the heat they'd normally get from the mother. 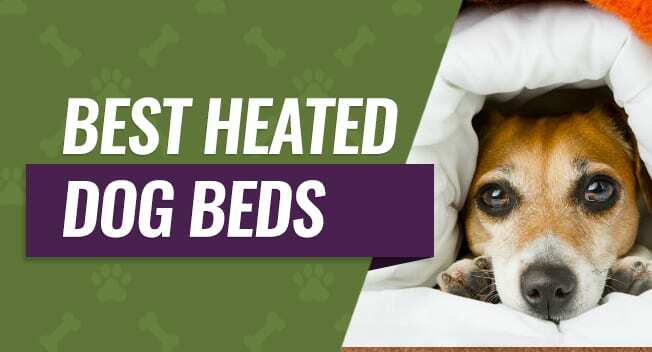 Now that you know a few good reasons why you may want to consider a heated dog bed, you should know that there are a few types available to pick from. These different types of dog beds can all work for your dog, but some of the designs will suit your needs better than other ones. A bolster style heated dog bed comes with the heating element installed in the bottom of the bed, and it also comes with padded and raised walls for your dog to rest against. The heat travels across the bottom of the bed and up the walls to surround your dog, and you commonly see these types of beds inside. 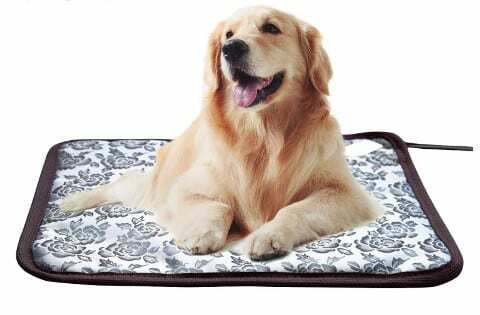 A flat pad heated dog bed is a good choice if you have limited space or if your dog spends a lot of time in their crate. You can get them made out of a thicker memory foam to help with arthritis, or you can get them with slightly less filling, and the heat travels to all corners of the bed. Maybe your dog doesn't have a bed, but they spend a lot of time on a certain piece of furniture like a couch or loveseat. If this is the case, a flat sheet or furniture cover with a heating element inside is a convenient and portable option for your dog to sleep on. If your dog spends a lot of time outdoors, they could benefit from having a raised but heated bed with a durable PVC frame. 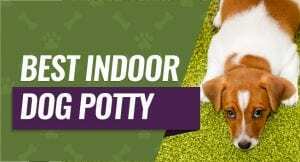 The part where your dog lays is usually padded with a zip on and off cover for easy washing, and it stays dry since it's designed to sit on the PVC frame off of the ground. No matter which type of heated dog bed you end up buying for your dog, you want to make sure that it's a safe and comfortable option that your dog loves to sleep on. If your dog is just a puppy that still has growing to do, you may want to consider buying a larger heated dog bed right away and letting them grow into it. You should get a dog bed that is slightly larger than your dog because this helps to ensure that they have enough room to stretch out, move around, and stay comfortable. Unfortunately, your budget is going to play into which type of heated dog bed you end up purchasing because it can get expensive. 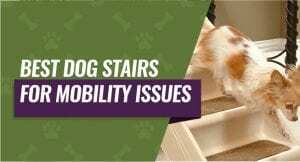 Typically, larger beds and orthopedic dog beds are more expensive, but you can shop around and find some that will fit into almost any budget. Indoor dog beds most likely won't be durable enough to withstand the changing weather conditions that they'll be exposed to if you put them outside. Think about where you plan on having the dog bed the majority of the time, and this can help you narrow down your search right away. 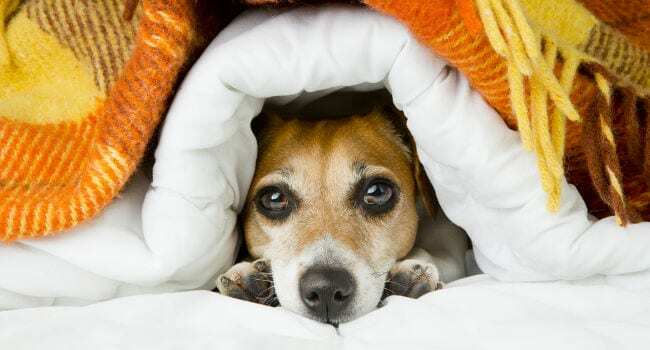 Having a working thermostat on your dog bed lets you quickly and easily adjust the temperature, and this is extremely important when it comes to the safety of your dog. You don't want the bed to get too hot and burn your dog when they lay on it, and a thermostat gives you greater control over the bed's temperature. You can get dog beds with an electric heating element or with thermal-reflective materials that bounce your dog's body heat back at them. Electric dog beds can get to warmer temperatures and maintain a steady temperature, but thermal-reflective dog beds can also get warm without using any electricity to do so. Eventually, you're going to have to wash your dog's bed to get rid of any stains or odors that may cling to the fabric. If the bed is too large or bulky to fit into your washing machine, look for one that comes with a protective cover that you can remove and toss into your washer and dryer to clean. You want your dog to stay safe when they use their bed, and this is why it's important to look for a bed with built-in safety features. Some beds have a thermostat to monitor the temperature while others have an automatic shutoff switch that will power the bed down when it reaches a certain temperature to prevent it from overheating. Take a good look at the material quality on your heated dog bed because this is going to play an important role in how long it lasts, and it's also a safety issue. Look for a bed that has double stitching around the seams, a non-slip bottom, and a protective cover that will withstand normal wear and tear. Do you plan to take your dog bed with you on trips or move it around your home on a frequent basis? If so, you want to find a heated dog bed that is easy to move around because this will reduce the amount of time that you spend trying to pick up and store the bed. This heated pet bed comes in either medium or large sizes, and it features a thickly padded bottom that is designed to cradle your pet and mold to their bodies to provide support if they have arthritis or hip dysplasia. It comes with a built-in dual thermostat that monitors and adjusts the temperature as your dog lays in their bed. The cushion and heating element are removable, and you can keep the heater plugged in 24 hours a day without worry because it comes with a one-year guarantee and it is energy efficient. It comes certified to exceed USA and Canadian electrical standards, and this gives you peace of mind because you know that your dog is safe when they use this bed. Pet parents who bought this heated bed liked that it came with a dual thermostat and an energy efficient design that they could leave plugged in 24 hours a day. They didn't like that this bed was slightly smaller in size and that it wasn't suitable for outdoor use. This heating pad comes in one size with a neutral black and white floral design that is designed to fit in with a variety of decors. You'll get a bed that heats up in just 10 minutes after you plug it in, and it also comes with a chew resistant cover and cord for added durability. The temperature control is very easy to operate and set to your desired temperature, and you also get a six-month warranty on each pad that you buy. The outer material is waterproof, and this means that you simply have to wipe it off to clean it with a damp rag when it gets dirty. Pet parents who bought this heating pad liked that it was very flat because it made it very easy to pick up and take with them or store, and they also liked that it heats up in only 10 minutes. They didn't like that this heating pad doesn't offer much support and that the cord is slightly shorter. This self warming pet bed comes in five different sizes, two different colors, and three different styles including a pillow, rectangle, and round bed so you can choose the bed that fits your dog the best. This bed is designed to be lightweight and portable but durable, and it features a non-skid coating along the bottom so you can set it on laminate or hardwood floors and it'll stay where you put it. The soft fleece is perfect for your dog to snuggle down into, and it's easy to pick this bed up and take it with you when you go or to store it. Pet parents who bought this dog bed liked that it came in several sizes, styles, and colors because these options let them pick out the best bed to suit their dog's needs. They didn't like that the sides tended to fall down or get flat quickly, or that this bed wasn't as durable as a few other options. This heated dog bed comes in three different sizes ranging from small to large, and it features a soft but durable covering that is capable of withstanding wear and tear. You can use this pad both inside and outside, and the soft fleece outer layer is removable and machine washable for easy maintenance. This bed comes with a layer of orthopedic foam that is designed to cradle your dog and mold to their body when they lay down for greater comfort. The heating element is easily controlled by a thermostat that is attached to the power cord, and this bed is good for up to 20 degrees below zero. Pet parents who bought this heated dog bed liked that they could use it both inside and outside safely, and they also liked that it came with orthopedic foam for an insert. They didn't like that this bed isn't pressure sensitive, and it seems to draw power each time you plug it in rather than switching on and off as your dog gets on and off the bed. This dog bed cave comes in 15 different colors and three different sizes, and each cave offers 360-degree coverage that is great for smaller dogs who like to burrow and be surrounded when they sleep. The fleece and sherpa material traps and holds their body heat in once they generate it, and this means that the bed stays warm as long as your dog is inside. 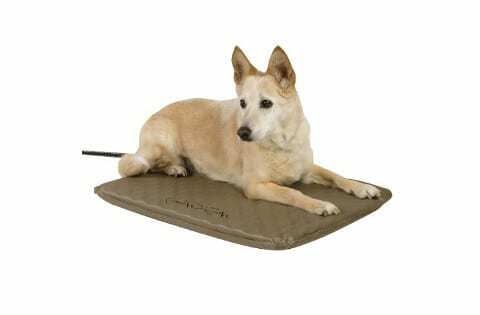 It comes with a soft but flexible design that encases your dog when they lay down, and it features a removable covering with a heavy-duty brass zipper that makes it easy to remove the outer layer to keep it clean. You can also keep the plastic bar in the cover, so it holds a shape, or you can remove it and let it hang down and cover your dog. Pet parents who bought this dog bed liked that it came in several different sizes, and they also liked that they could remove the outer layer quickly and easily to wash it. They didn't like that the bed has slack on the sides, and this slack can cause your dog to slip around when they're trying to get into the bed. 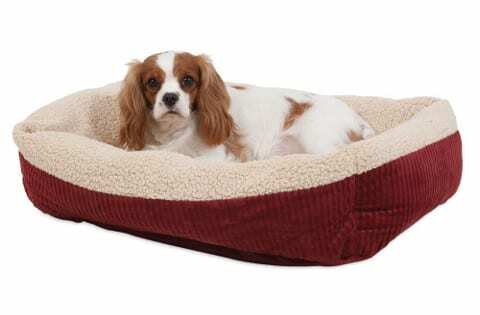 Our pick for the best heated dog bed is K&H Pet Products Thermo-Snuggly Sleeper Heated Pet Bed. We liked that this bed had a thicker bottom padding that supported the dog when they used the bed, and we also liked that it had a built-in dual thermostat that made controlling the temperature quick and easy. This bed also stood out because you can keep it plugged in constantly without worrying about it getting too hot. It also has extremely high electrical standards, and this is very important because we want our dogs to be happy, healthy, and safe.